One of my fave hobbies is Scrapbooking. So I thought I might run a series of Scrapbooking Techniques & Tips on the subject. If you find this useful, I’d really appreciate you leaving a comment so I can get an idea of whether it’s worthwhile continuing with this or not. When you have a special photo and you really want to ‘showcase the moment’ try scanning an item of clothing that the subject was wearing in the photo and using it as your background for the layout. It doesn’t matter if there are creases or seams or pockets in the scanned image; that will only add to the uniqueness of the background. My suggestion would be to scan at the highest resolution that you can. Then using your photo editing or drawing software (Photoshop Elements 4 is my weapon of choice), open a new file with a transparent background in the size of your layout. I usually pick a resolution of 300dpi for a good quality print. Drag your scanned image onto the new file (it appears as a new layer in PSE4). You can then move it around to find the best section to cover your background layer. You can Shift-drag on the corner of the image to reduce the size if necessary but don’t worry if parts hang off the edge of the background layer. Once you’ve positioned the image as you like it, crop it to the size of the background layer and build your layout. The example below is a photo of my daughter dressed for her formal in her last year of High School. 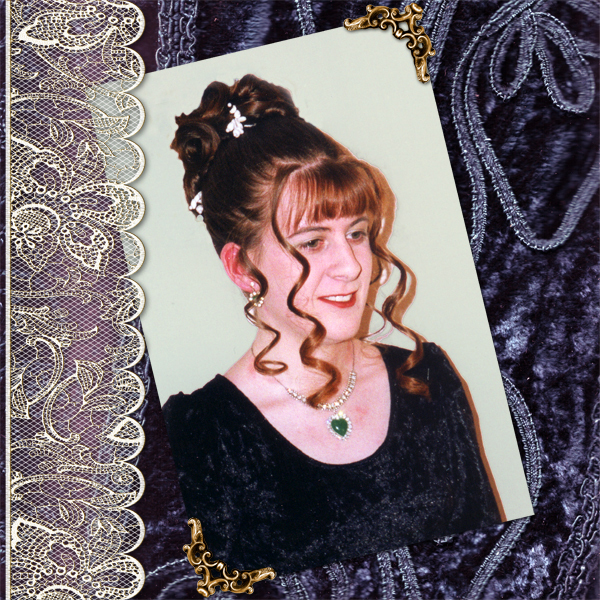 The background is a scan of the velvet dress she wore on the night. Hi Karen, I’ve asked about getting tutorials/tips into Clikchics and what you have to do is send it to Robyn (Clikchic) and take it from there… if it gets approved, then it’s into the Articles/Tutorials section! This is gorgeous. I actually scanned my dd’s favourite dress and used as a background in an SC article I did. Can’t remember which issue, but it was called colour v’s black and white..quite a while ago now. Love that you are writing tutorials here.. I love the idea, even if I do not have a scanner now! Hi, there. Thanks so much for the article. I’m a little lazy and it would require going to the “other” computer and scanning and then bringing over to my notebook, but in certain cases, like your example, it would be the perfect touch. Thanks. Glad you enjoyed the article Tami. And I agree that it’s not something you would want to do all the time. But it’s a cool idea for special layouts. Thanks Pam. I love doing this to create a truly unique and relevant to the event layout. If you don’t have a scanner, you could also snap a close-up photograph of the dress fabric with your digital camera. It wouldn’t even matter if it was a teeny bit out of focus. If you’re feeling particularly ambitious, you could even run an artsy photoshop filter on it, if you happen to have that program. I like that idea dvana. Thanks a lot.